Then I realized I had two more problems… First – I did not necessarily want to make the tops for myself, and the method described in this book basically assumes you are doing patternmaking for either yourself, or you have a model available so you can take all the measurements. For constructing the basic bodice and the sleeve, you need about 20 different measurements. Hmmm… that seemed like a lot! There is a chart in the book, containing standard measurements to use if you don’t have a model, but… and here comes the second problem… the standard measurements! Where does this standard come from? What height does in assume? And it starts with the size it calls 6, which is close to Burda size 38. What about smaller sizes? I wanted to make my patterns in a few different sizes. All my sewing over the years was done using Burda patterns – I always liked how they fit (and I have been a couple different sizes myself), so I wanted to use the same measurements Burda uses (I tried a few patterns from other companies – not with good results). But the measurements found in Burda magazines and this website includes only a few of the measurements I would need to use this method. So what to do? So I looked further and found two more books that use simplified methods to constructing sloper – which means you need fewer measurements. 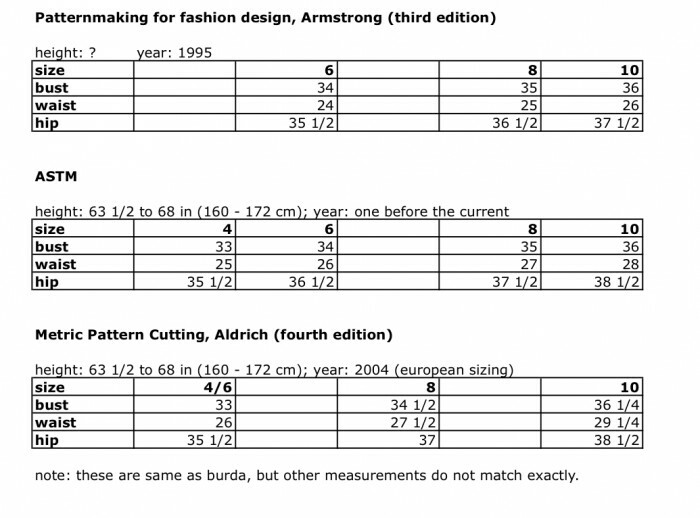 The first one is the Metric Pattern Cutting by Winifred Aldrich. This method uses 10 measurements (this is for the basic bodice only, not including the sleeve). This method is very similar to that described by gedwoods here on Burdastyle (Constructing the basic bodice block). After reading the instructions in the book and gedwoods instructions, I found that I could construct the basic bodice using only 7 measurements from a Burda measurement chart (bust, waist, shoulder length, nape to waist, neck size and back length, back width) and the other 3 can be estimated (armscye depth, chest width and bust dart width). OK, so that would solve my problem of using the measurement chart that does not include all 20 measurements. The second book I found was Fundamentals of Garment Design which is the first textbook in the Bunka Fashion Series published by Bunka Fashion College in Japan. Japanese pattern books (like Mrs Style Book, Lady Boutique and others) are quite popular, but many people have had problems using the patterns that come with these books since they have been made for a typical Japanese woman with the height of about 158 cm – just for comparison, Burda patterns are made for an average height of 168 cm. that is a difference of 10 cm or 4in!. That is a lot, and these patterns will not fit taller women. 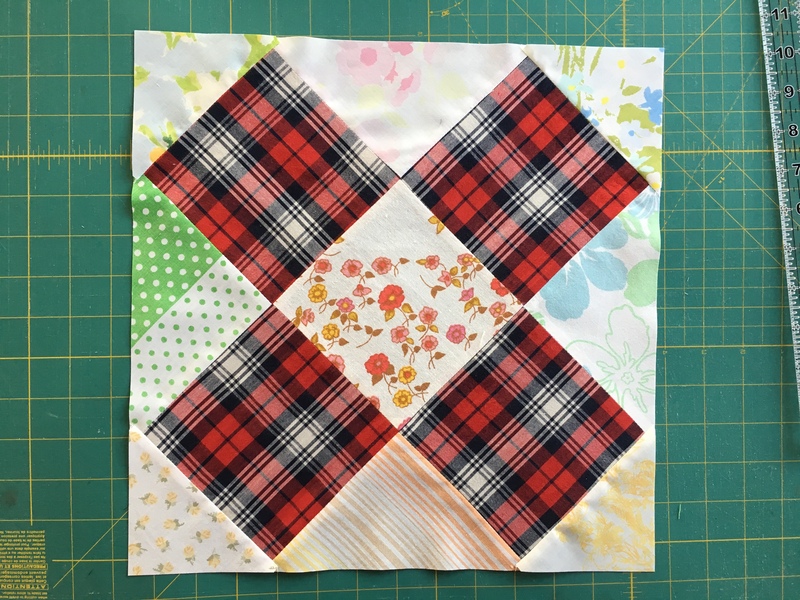 This entry was posted in patternmaking, sewing on June 8, 2011 by flekka. i also have Armstrong Pattern making book. I just start to follow and and also confuse the research of their size standard.I have a problem with model measurement even i accept that the Armstrong’s measurement is very details and clear of the Human Anatomy. Rather I saw the magic pattern of Bunka i bought one and read the sloper. I always confuse how can they calculate all parts from bust circumference. Unfortunately i can’t order the Fundamental of Garment Design and other books of its. cause it’s not available on book store and online book store. Anyway I always look for the updated information of How to make the good pattern with the nice out put fitting.